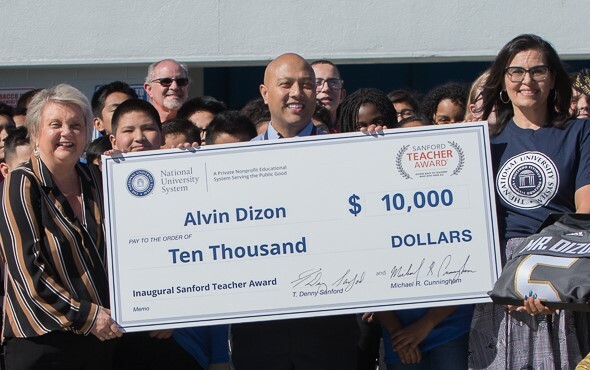 Clark County, NV – In recognition of teachers who inspire students to achieve their greatest potential, National University System has launched the first annual Sanford Teacher Award, a half-million dollar award campaign to honor the nation’s top inspiring PreK-12 teachers. The Sanford Teacher Award competition, which concludes Nov. 1, will award the top inspirational teacher in each state with $10,000, with the exception of one top teacher who will be named a national winner and receive a grand award of $50,000. As part of the outreach activities, eighth grade teacher Alvin Dizon, of Robert O. Gibson Middle School in the Clark County School District, was recognized for being one of five inaugural Sanford Teacher Award recipients identified for their commitment to creating inspirational and harmonious classrooms that support student development and achievement.